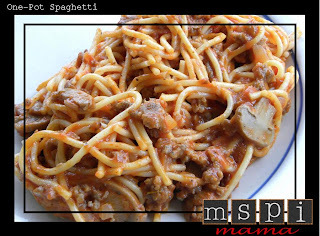 Spaghetti is definitely near the top of the list of favorite family meals in our household. I usually have the ingredients on hand, and it's easy to throw together at a moment's notice. But it can get a little boring. This recipe from Better Homes and Gardens uses the same ol' ingredients but jazzes things up a bit in the preparation department. Because the pasta cooks right in the sauce, a deeper flavor develops. Serve it with a salad and garlic bread. Your family will love it! In a large saucepan cook the ground beef or sausage, fresh mushrooms (if using), onion and garlic until meat is brown and onion is tender. Drain. Stir in the canned mushrooms (if using), broth, water, tomato paste, Italian seasoning and pepper. Bring to boiling. Add the broken spaghetti, a little at a time, stirring constantly. Return to boiling; reduce heat. Boil gently, uncovered, for 17 to 20 minutes or until spaghetti is tender and sauce is desired consistency, stirring frequently. Makes four servings. This is super yummy. I don't care for mushrooms so I used a can of diced tomatoes instead. Cut the water by 1/4 cup to account for the liquid left after draining the tomatoes and added a tiny bit of sugar to cut the bitterness from extra tomatoes.